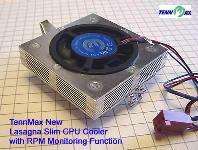 Tennmax has generously sent to us 3 models of their Lasagna Coolers which are very thin (1 cm) heatsink/fan modules. They are specifically designed for 1U servers and are very efficient, even more than many other bigger solutions. We'd like to thank them particularly because they made us progress a lot in our researches. We finally understood that our motherboard wasn't smartly designed and suffered from several conception mistakes. Jan, 19th 2015 : We finally installed a Wiki! 8 years later, we're trying to push updates to the site that we migrated to use MediaWiki. It's taking time to reinject contents there, but we're doing it. More links will appear and we'll reinject contents that we had on our laptops that were never published, such as various howtos. Stay tuned. The new dedicated server (Dedibox) allows us to set up an FTP and eases the maintenance of the packages. We are also installing a mailing list and other development tools to accelerate Formilux development. Many people have asked us about the linux distro we use on the server. We had used some Slackware components after having removed unexpected files. But maintaining this solution was too difficult so we built a file based distro: Formilux was borned. Due to long repeated failures of the ADSL line provided by France Telecom, and the inefficiency of their support, we had to move the site to a stable provider, online.net. We used this occasion to give it a new style as you see here. The old one will be available again at the old address http://1u.homeip.net/ when the ADSL line comes back. The new official address is now http://www.ant-computing.com/. April, 29th 2001 : New prototype finished! After all our thoughts about components choice and placement, we finally built a new box we wanted to call version 1 but indeed, not only was it ugly, it was also incomplete. We finally destroyed it in favor of the real version 1. Not much to read about it, but several photos taken with poor light. April, 4th 2001 : Really thin Lasagna Coolers (tm) for free ! As a result of our brain masturbation we finally knew more precisely what we needed for a new prototype. We progressively began to buy some hardware and other pieces of metal, plastic, and tools, but this time was still more towards paper than soldering. March, 8th 2001 : Slashdotted !!! We were quickly asked for production-quality versions and began to work again on it, planning for a version 1 prototype for late Q2 2001. January, 20th 2001 : Cool CompactFlash-ATA adapter for free ! ESSKABEL has generously sent us the CompactFlash-to-ATA adapter that we were trying to build for a few months. Its design is purely perfect, it's robust and very very small (far smaller than the one we were trying to do). They also sell 44-pin adapters which we'll certainly test for a new design. Special thanks to them for this helpful donation. We can now stop playing with Eagle. This was our first server. We simply wanted a cheap, small, and reliable Internet server, and this one took to us only one week-end to build from scratch. It still disserves web contents after several months of faultless production. It was based only on salvage hardware (486...) but helped us a lot in understanding what we really needed for a more serious version.